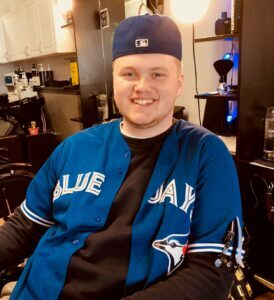 BARBER LOUNGE is a modern barbershop catering exclusively to guys of all ages, owned and operated by Jehane Miller who brings over 17 years of experience in the industry and offers world-class cuts and shaves. Whether you want a vintage, classic, or modern look, we’re the barber shoppe for you! We work by appointment booking and offer walk in's on a first come first served basis, which is not always guaranteed. To save you the hassle of being turned away, we also offer an online booking option! Book Now! Tuesday 9 - 7, Wednesday 9 - 5, Thursday 11 - 7, Friday 9-5, Saturday 9-3 Haircuts $20! Walk-ins are great, however, the ONLY, 100% and sure-fire way to guarantee an appointment is to book one! Book Now! "There is a reason they book up weeks in advance! They really know what they are doing at this barber lounge! Love it! :)"
"Fixed a disaster caused by kid with scissors. I can't believe what they managed to do with what he had left!" "Best haircut in town by far!" "Great cut, great convo and great playlist. Always a good time at the Barber Lounge!"